The Left’s political rally in Tel Aviv on Saturday proved how low public discourse in Israel has sunk, and how the aggressive, crass discourse has trumped the important issues that should take center stage. The “talkback culture” is represented by two people in this regard: left-wing artist and commentator Yair Garbuz, who criticized those he called “a handful of amulet-kissing idol-worshippers who have taken over the country”; and right-wing journalist Hagai Huberman, who described Michal Kastan Keidar — widow of Lt. Col. Dolev Keidar, killed in Operation Protective Edge in the Gaza Strip — as a woman who “killed her husband and now wails that she’s a widow.” Both Garbuz and Huberman have stated they will not apologize for their words. Garbuz came under fire for his repulsive statements and the condescending way in which he lashed out at parts of Israeli society. Of the various criticisms leveled at him, I do not know whether I would subscribe to the word “racist,” since as condescending as Grabuz was, he did not target one specific ethnic group. The definition of the “handful” of people Grabuz feels have usurped Israeli democracy was as vexing as the contempt in which he uttered these obscenities. It seems he believes that only secular leftists are fit to govern Israel, and that only Grabuz-like individuals have the right to run for and be elected to office. 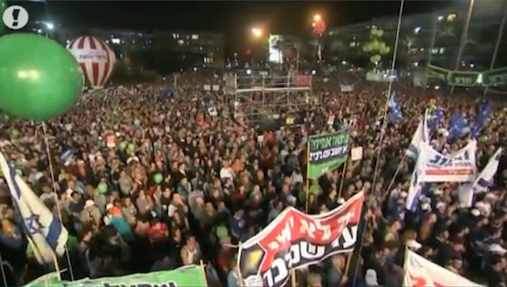 And the masses in Rabin Square heard him and cheered. Huberman’s vile “wailing widow” comment followed almost immediately, as if to prove that undemocratic, aggressive discourse was not reserved solely for the Left. Much like Garbuz’s speech, which was carefully crafted and intoned, Huberman’s opinion piece on the Israel National News website was no slip of the pen, but the expression of an organized worldview. Much like Garbuz, Huberman too believes that only those who share his opinions have the right to express them and take part in the public discourse. He was preceded by right-wing politicians, who still rebuke the residents of the communities on the Gaza Strip border, saying they have no right to complain about their loss and distress over terrorist rocket fire because they supported the 2005 disengagement from Gaza. This too goes beyond crass and insensitive remarks — worldviews that negate any contrary opinion and the right to express it are deeply disconcerting. One can agree or disagree with former Mossad chief Meir Dagan’s opinions about government policies on the Iranian threat, for example, but we cannot negate holding a public debate on the issue. Unfortunately, this debate was also drowned out by the quagmire-like Garbuz-Huberman controversy, and not by coincidence. After all, both have made words, writing and rhetoric their art. Hopefully, this will be the final chord in an election campaign that has focused mostly on insignificant matters, and was rife with provocation and slander while ignoring the main issues on the public’s agenda. This election campaign comprised empty bottles, quotes by the prime minister’s wife, and heated debates on the quality of YouTube videos released by parties, as well as carefully crafted statements whose sole objective was to make headlines, swearing and insults. The “talkback culture” has taken over public discourse, and that should worry us all. Is Israel’s government about to cancel our civil rights? The right to vote – even from abroad?